True sanctuaries are unbelievably difficult ventures to undertake and maintain. That is why you may hear of sanctuaries that are full to capacity, struggling or changing management. They are not open to the public because the welfare of the animals, many of whom have been severely neglected and abused, always comes first. Without the revenue generated by public ticket sales, these facilities must rely on other means of funding. This may include a limited number of well-planned educational and fundraising events each year to supplement the support provided by individual donors. True sanctuaries also work to stop the problem at the source. In addition to caring for rescued animals, they educate the public about the problems of captivity in order to stop the exploitation of wild animals. At PAWS, we go even further. We initiate and help pass legislation to restrict and to ultimately prohibit the use of wild animals in entertainment and as pets. We also advocate for an end to the captive breeding of wildlife, especially those animals who are casually discarded after they no longer are of use or become a financial burden. PAWS regularly monitors the plights of elephants around the world, through contact with other animal protection organizations close to these situations and via the news media. One of these elephants is Anne, who spent most of her life in a traveling circus where she was cruelly beaten and abused. She is now living at the Longleat Safari Park in the United Kingdom. Anne was born in Sri Lanka where she was abducted from her family in the 1950s and sentenced to a lifetime of servitude in the animal entertainment industry. In the Bobby Roberts Super Circus, Anne was forced to perform unnatural and potentially harmful tricks, and she gave rides to uninformed people who thought elephant rides were fun. She was chained and abused with a bull hook - a spike-tipped weapon resembling a fireplace poker - and beaten when she failed to comply with commands, or sometimes for no reason at all. When not performing, Anne was chained by the legs and often spent her time devoid of the companionship of other elephants. In 2011, a video exposé by Animal Defenders International showing Anne being savagely beaten by circus trainers ignited public outrage. This led to concerted efforts by individuals and animal welfare organizations to remove Anne from the circus. In Europe and the UK, there are no elephant sanctuaries. So the decision was made to move her from one facet of the animal entertainment industry to another: from the circus to a zoo. Both Whipsnade Safari Park and Longleat Safari Park offered to take Anne. Whipsnade had an existing group of young elephants and would have been a shorter trip for this compromised elderly elephant. Longleat was chosen as her home. Anne's transfer to the Longleat Safari Park was heralded as a victory by nearly everyone in the animal welfare world. It was indeed a step in the right direction - even if conditions at Longleat were imperfect. Anne was in a far safer place and she would receive needed veterinary care. player in a commercial animal entertainment industry that depends on the display of wild animals for income. 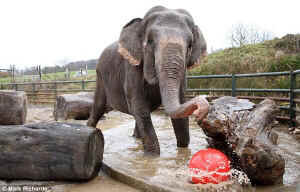 Throughout its 48 year history, Longleat has been home to elephants - 32 that were relocated to other zoos, circuses and safari parks before Anne arrived, and two that died. Talk of creating a "bigger" elephant enclosure at Longleat, still only a few acres in size, signaled that elephants might again be acquired and displayed there. "Sanctuary" is often tossed around all too loosely. Calling a facility a sanctuary does not necessarily make it one. Commercial facilities, by their very nature, will never be sanctuaries. Facilities that are accredited by the European Association of Zoos and Aquaria (EAZA) that promote and support captivity and breeding programs are most definitely not sanctuaries. Facilities that acquire, purchase, discard, trade and euthanize animals for their own convenience cannot be sanctuaries. Facilities that are part of a zoo association that condones the killing, butchering and feeding of giraffes to other animals at a zoo can never be a sanctuary. Those who euthanize lions because they are beyond breeding age or too young to cope with their distorted captive situation can never be a sanctuary. Many times "rescued" animals are transferred to facilities that call themselves sanctuaries even though they are open to the public daily and are dependent on ticket sales for their revenue. In true sanctuaries, the animals are not on display; the aim is to provide a more natural and intrusion-free life for them. If we sit back and allow animal entertainment entities to call themselves "sanctuaries" we are defeating our own purpose. We will be sending the message that captivity is acceptable for elephants and other wild animals when it is not. Fortunately, Longleat has opted not to create a sanctuary. Anne in her small outdoor yard at the Longleat Safari Park in the U.K. In February, Longleat invited a group of elephant experts to attend a meeting to discuss Anne's future. I was one of those who attended. I was asked to provide my expertise on what it takes to create a sanctuary, and, more importantly, I also discussed what it means to be a sanctuary. I visited Anne and I saw her facilities. I can tell you that Anne desperately needs a new indoor and outdoor area and she needs to be managed without use of the bullhook. The zoo says it will improve her exhibit, as reported in the media, and that they will adopt the protected contact management system. Both of these developments would be positive for Anne. The zoo has also stated that when Anne passes away her new enclosure will be used for another species, not for confining and displaying more elephants. Anne's indoor facility at Longleat needs improving now. Any delays would further compromise her well being. She cannot go through another winter in the situation she has been in for the last three years. The zoo has now proposed significant improvements to Anne's living conditions and I am cautiously optimistic about these promises of change. We must all continue to monitor this situation to make sure these promised improvements are expedited. Contrary to reports, none of the experts at the meeting believed it was optimal to keep an elephant alone. [According to an online world-wide elephant database, there are more than 40 elephants living alone in Europe today.] Anne was originally sent to Longleat with the support of the public and animal protection organizations. For this specific elephant, and her specific circumstances, at that point in time, Longleat apparently provided a viable option for Anne. Even though we in the animal welfare/animal rights community always hope there is good answer to a problem - the perfect solution - sometimes there just isn't one. This is the case for Anne, who is now 60 years old (very few elephants in captivity live beyond 50), and whose hind legs are crippled from her years in captivity. Her back feet drag on the ground when she walks, and she cannot climb even the most modest incline when the ground is damp. If a wonderful elephant sanctuary existed nearby, and Anne was determined to be sound enough to make an easy trip to be with other compatible elephants, I'd say move her. This is just not the case. Unfortunately, Anne has been put into an almost impossible situation through no choice of her own. These are the conundrums that captivity creates - and the animals are always the ones to pay. I would like to applaud the efforts of all the organizations and individuals who have worked so hard to improve the life of this special elephant and who continue to monitor her well being.